One of my favourite things to do when I return home is to reconnect with friends over a delicious breakfast. Finding a restaurant that values the importance of this meal had proved difficult, until I discovered the Seine River Cafe. They will deliver an exceptional experience and amazing flavours that will not disappoint. 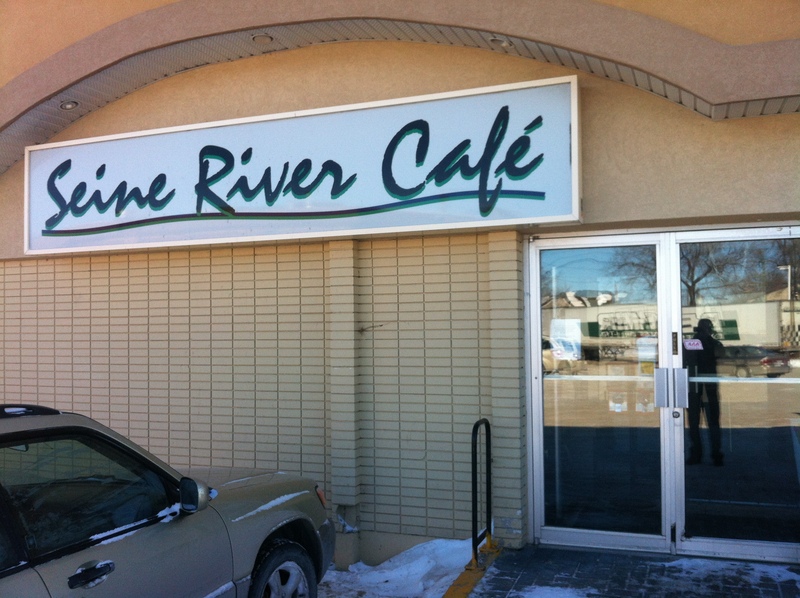 Nestled in the heart of the french community of St. Boniface in Winnipeg, the Seine River cafe is a local hot spot to come and enjoy a good meal with friends. The staff strive for excellence and the quality of their menu keeps me coming back, even after I moved away from the city. Bring your appetite since the large portion sizes will certainly not leave you hungry. The menu features an all day breakfast with traditional favourites such as Steak & Eggs, fruit Waffles, and Eggs Benedict as well as burgers and sandwiches for the rest of the day. You can view their entire menu online here. My personal favourite is the Mexican Skillet. 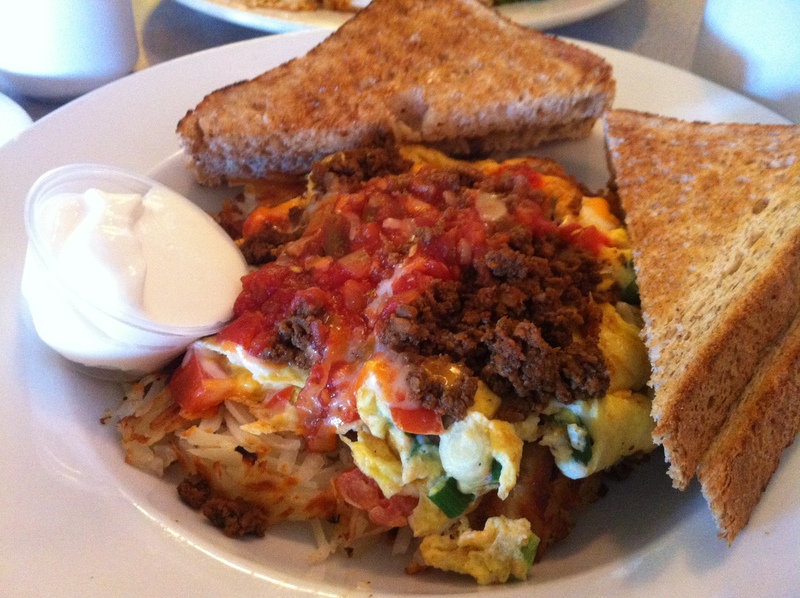 This dish features eggs made to order on a bed of potato hash-browns, tomatoes, peppers, salsa, sour cream, and served with your choice of beef or chicken. 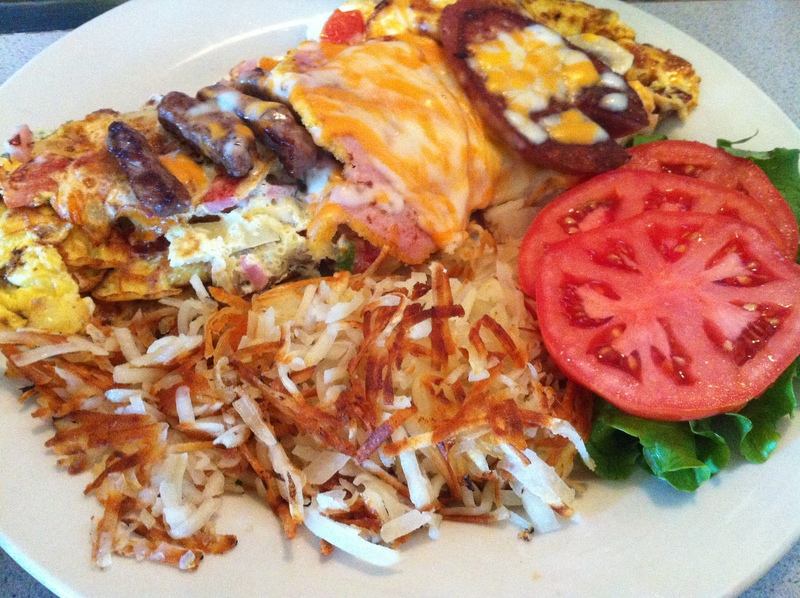 If you are looking for something a little (or a lot) bigger, the Seine River Special Omelette is for you. This omelette is stuffed beyond full of pretty much everything you could think of. Including side-bacon, back-bacon, sausage, steak, kubasa, peppers, tomatoes, jalapeños, and cheese to name a few. Leave me a comment below to let me know about your experience. I hope you enjoy and happy dinning! This entry was posted in Restaurants & Reviews and tagged 2013, Breakfast, cafe, Canada, Manitoba, Restaurant, Seine River Cafe, Winnipeg. Bookmark the permalink.